"Peaks Island and Harbor from Fort Allen Park, Portland, Maine." Peaks Island and Harbor from Fort Allen Park, Portland, Maine. 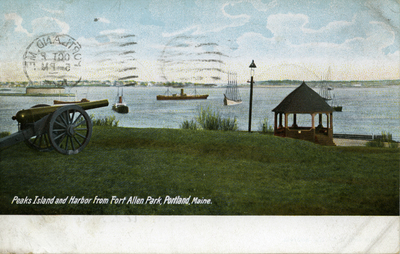 General view of Casco Bay and Fort Allen Park, from west. Peaks Island in background. Postcard mailed in 1905. Printed by M.C. Leighton, Co., Portland, Me. Made in Germany. "Peaks Island and Harbor from Fort Allen Park, Portland, Maine." (2017). Portland Postcards. 39. Fort Allen Park, Munjoy Hill, East End, Portland, Me.